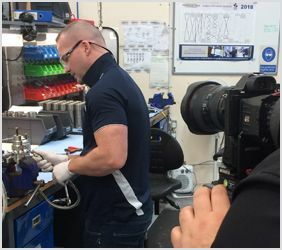 Pressure Tech - Quality Pressure Regulator Manufacturers - LIGHTS, CAMERA, ACTION... PART II! After a successful day's filming last week, today we utilised a drone to capture video footage of the beautiful local Derbyshire scenery. The weather just about stayed bright for long enough, but it wouldn't be authentic British weather without a few grey clouds providing a little dramatic ambience! 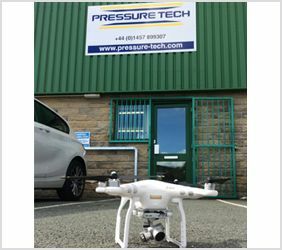 Our roving camera man ensured no-one was safe from being filmed going about their day-to-day jobs, including Pressure Tech MD Steve Yorke-Robinson who was busy working with a customer on one of our on-site test rigs!